NO, IT'S not a giant haystack - it's an example of one of the largest structures constructed by birds. Sociable weavers (Philetairus socius) build huge communal nests - multistorey apartment complexes - from sticks and grass. The structures last for decades, sometimes over 100 years. Multiple families live together and even help raise each other's young; you could call them socialist weavers, though that might bring to mind a collective of 19th-century Lancashire textile workers. The birds - anything up to 100 pairs per nest - live in the harsh Kalahari desert in southern Africa. The thick thatched roof protects them from the sweltering sun, and retains heat during the chill desert night. 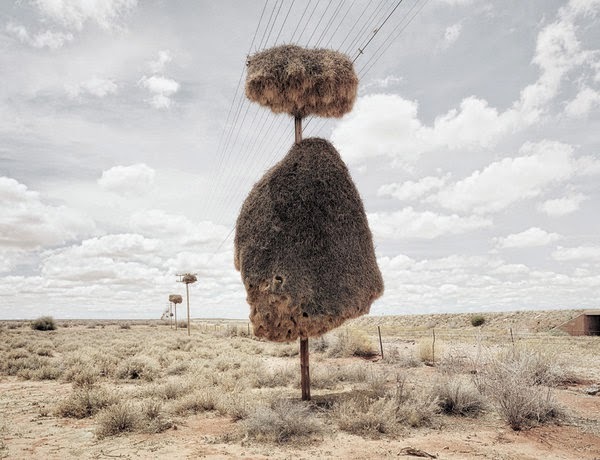 Photographer Dillon Marsh is interested in how humans and other animals interact, and the weaver's habit of building their nests on telegraph poles attracted him as a subject. "I then became intrigued by the way the nests, although inanimate, almost seemed to be living organisms as they are in a continual state of collapse and repair," he says. Food is not super-abundant in the desert, so the birds, pictured below, delay breeding until they are 2 years old. It's one of the reasons that it makes evolutionary sense to live communally. In the past the birds had to nest in trees, something else not commonly available in the desert. Telephone poles have allowed the weavers to expand their range.